comScore Digital Analytix is an online solution that provides insights into your user base through the best of analytics and audience demographics. It provides visibility on how your customers use different media, such as TV, video, mobile, desktop and more. 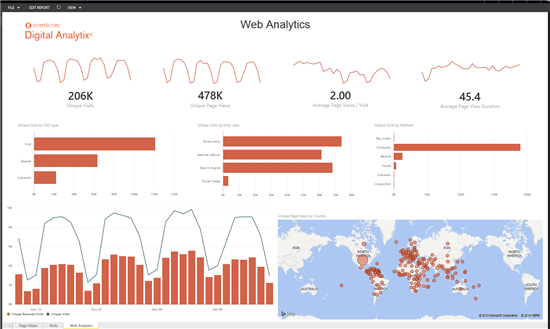 With the Power BI comScore content pack, you can quickly connect and begin gaining insights into your web analytics data. This content pack includes an out-of-the box dashboard, a set of reports, and a curated data set to help you explore and drill into your data. In this post we will provide an overview on how the Power BI content pack helps you visualize and draw insights from comScore Digital Analytix data. 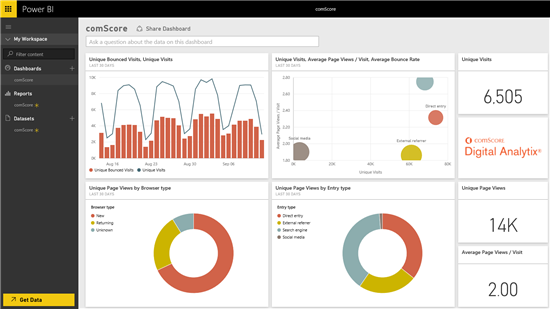 For additional details on how to get started, please see the comScore content pack for Power BI help page. After you connect to the content pack with your comScore Digital Analytix account credentials, a dashboard will be automatically created. Once the dashboard is loaded you can select any of the tiles or visualizations to drill in further to the Page Views, Visits, and Web Analytics reports. Try selecting the first tile, which leads you to the Web Analytics report. This particular report includes a set of visuals with different insights such as unique visits and page views. You can hover over any of the items for additional details, or select a particular component to cross filter the other visuals on the page. The filter pane plane allows you to slice the data to fit your needs. Reports can be customized by switching to edit mode on each individual report. In edit mode you can see the list of fields available in the dataset. You can edit or add additional visuals to customize your report. From the report view you can pin any of the visuals to the dashboard to meet your personal requirements. After the initial import of the data, the dashboard and reports will continue to update daily. Refresh schedule and frequency can be modified on the dataset. 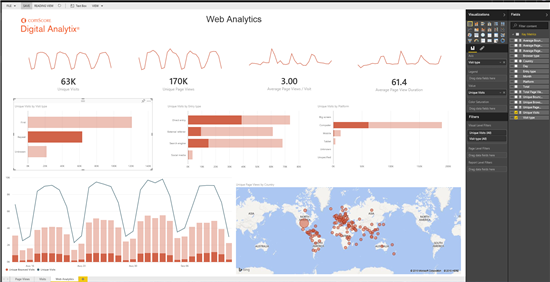 With the comScore content pack for Power BI, you have an initial set of visuals, metrics, and actionable insights to help drive strategic decisions in the digital world.